1) What is Detox Patch? Detox pads are patches made from natural ingredients that extract toxins from the body by simply sticking it onto the soles of the feet. It is made in Japan and is composed of all-natural ingredients and is proven to be a safe, effective, convenient and economical method of detoxification. 2) Is Takara Foot Patch safe to use? and do I get any side affects from it? Yes. Detox pads are externally applied. Nothing is ingested or injected. Aside from allergies to the ingredients used, to date, no side effects have been noted. 3) How often will I need to use Takara Detox Foot Patches? It is recommended that Detox pads be used daily for at least 1 week every 3 to 4 weeks. A good indicator is the color of the pads after use. Since the color of the pads becomes lighter after every use, application of Detox pads may be halted when the used pads no longer become discolored. After a few weeks, use of Detox pads may be resumed. 4) Where would I apply Takara Foot patch? Detox patch should be applied only on your foot (feet). 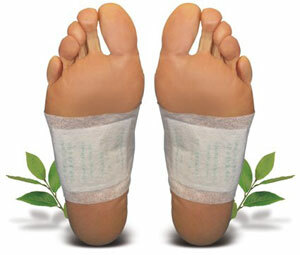 However, the detoxification will not be as thorough as when used on both feet. After using the Detox pads on one foot, you will feel that the leg with the Detox pad is lighter than the one without. 5) Can I wear Takara Foot Patch all day? Yes you can wear the pad the whole day. There is no effect in doing so. However, there might be a point when the extracted toxins are so minimal that wearing the pads the whole day might simply be a waste of money. 6) What are toxins and how do I get them? Bodily toxins come from a variety of sources. Among these are chemicals in the food we eat, the pollution in the air we breathe, the harmful substances from smoking and drinking, and as a by-product of the body’s metabolism. 7) How do toxins affect me? The accumulation of toxin results in poor health as manifested by weakness, pains and aches, a less efficient immune system, which in time will result in sickness or disease. Thus, it is very important that bodily toxins should be removed regularly to maintain good health. 8) How do I remove body toxins? Toxins are expelled from the body mainly through the excretory system. For various reasons however, modern lifestyle is not conducive to the efficient and regular removal of toxins. Thus, even if one exercises regularly, our bodies accumulate toxins to the detriment of our health. Detox pads are the answer to the problem of accumulating toxins. By using Detox pads regularly, one can safely and effectively eliminate toxins from the body. The result is improved blood circulation, leading to a more energetic and healthy lifestyle, proper elimination of waste, and free movement of the lymphatic fluids. This translates to a feeling of vigor, easing of muscle and joint pains, improved immune system, and better sleep. 9) How does Takara Foot Patch removes toxins from my body? To understand how Detox pads work, we must first understand some fascinating facts about the human body. Traditional oriental medicine has long held the knowledge that distributed throughout the body are acupuncture points called meridians. Meridians act as channels that link various parts and organs of the human body and are directly connected to the function of circulatory and lymphatic systems of the body. It is also known that the human feet have a large concentration of meridians. Proper stimulation of these points in the feet explains why one feels very relaxed and energetic after a good feet reflexology massage. Through the combined action of wood vinegar, far infrared and minus ion emissions, the meridians are stimulated. This stimulation results in the breakdown of water and waste molecules that frees blockages in the circulatory and lymphatic system allowing blood to flow freely and waste to enter the bloodstream readily for elimination. 10) Does the Patch contains chemicals? No. Detox pads have 100% natural ingredients in it and what’s more, none of the ingredients get into the body. It merely stimulates the meridians on the feet to loosen the toxin plaques and extract it through the pores of the skin. In other words, any substance only travels one way – from inside the body and out and not the other way around. 11) Can I remove a used Patch and wear the same patch again? No. The pads are for a single use only because once the pad becomes saturated with extracted toxins and fluids, it loses its potency.